At one time in my spiritual quest I read the Bible right through in one year — three and a half chapters each day. I read over many great verses that I am now discovering with joy and enthusiasm. I received a letter one day from Canada, and instead of using postage stamps, the postage had been paid by the imprint of a franking machine or postage meter. Alongside the imprint was this slogan in bright red letters: “The righteous are bold as a lion — Proverbs 28:1.” This was the first time I had taken notice of this verse from God’s Word. I want to share some of its greatness with you. “The wicked flee when no man pursueth: but the righteous are bold as a lion” (Proverbs 28:1 KJV). Isn’t that tremendous? Proverbs is a great book on the renewing of our minds in our daily walk. This particular verse holds a real blessing when we understand its truth. “The wicked flee when no man pursueth…” When you know you have done wrong, you think everybody else knows it too. God had said that if His people strayed from His Word, they would have this condition of fear in their midst. In Leviticus 26:36 God said, “…the sound of a shaken leaf shall chase them; and they shall flee, as fleeing from a sword; and they shall fall when none pursueth.” Just the crackle of a dry leaf in the woods would start them running, falling upon one another in their haste to get away. The wicked flee, but what about the righteous? “The righteous are bold as a lion.” We need more lion like believers with boldness in evidence. The boldness of a lion is here compared with a believer. To understand this comparison, we need first of all to know what it means to be righteous. Romans 10:10 informs us that “with the heart man believeth unto righteousness.” It also states in Romans 3:22 that “the righteousness of God” is by the “faith of Jesus Christ unto all and upon all them that believe.” Having confessed Jesus as Lord and believed in our hearts that God raised Jesus from the dead, we were saved and we received the righteousness of God. To be a child of God in this age of grace is to be righteous. “The righteous are bold as a lion.” What is there about a lion that we should see in our lives as righteous people? Surely not the growl or the roar of a lion. A lot of believers think that noise is a sign of power; I was once one of them. “If we are going to have a good service, let’s have a noisy one.” Power will produce some noise, so we should not be as quiet as a cemetery; we do not want frost in the pulpit and icicles in the pews! But where there is power under control, the noise will be minimal, as every car owner should know. Let us consider the confidence a lion has. He is the king of the beasts. When he is hungry, he has confidence; he knows who he is. He knows the strength that he has within himself. Notice Proverbs 30:30, “A lion which is strongest among beasts, and turneth not away for any.” What about us as believers? “I can do all things through Christ which strengtheneth me” (Philippians 4:13); that is my confidence. Think also of the courage of the lion. A lion is not afraid of any animal. If he is hungry, he’ll go after almost anything. Do we have this courage? Think of some of the men in the Word of God, such as Daniel, Moses, Elijah, Paul, Jesus; do we have courage like they manifested? They knew they were righteous, and so they were bold and fearless as lions. God has not given us the spirit of fear, but He has given us the spirit of love, and of power, and of a sound mind (II Timothy 1:7). Therefore we can be fearless, just like the lion. And daring. 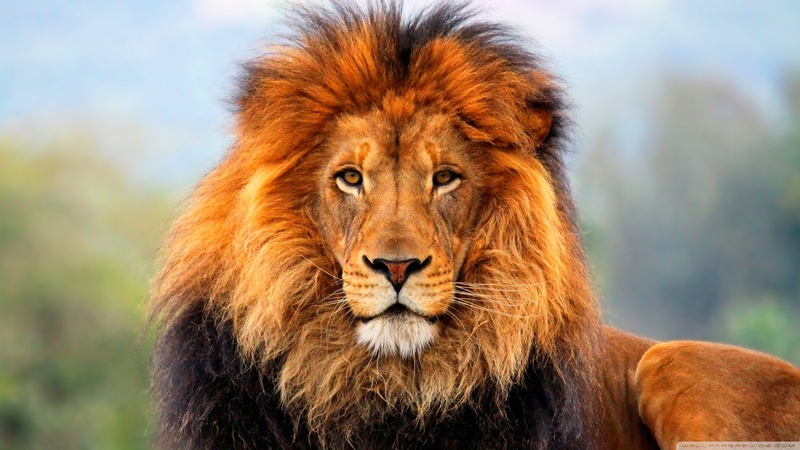 A lion will go right into an inhabited community if necessary; it doesn’t worry him at all if he thinks he can get food that way. We as believers need to have some courage and daring upon the Word of God. Boldness is something that is lacking among the average Christian today. Most do not act like lions. They seem almost scared, sometimes, to let people know they are Christians. And yet the Word says, “the righteous are bold as a lion.” How is boldness manifested? Many people have a wrong idea about this. Remember that first wonderful day when you found out what was available in Christ and you decided by an act of your will to accept it? Did you feel like jumping? Perhaps you did inside. But it is not how high you jump but how straight you walk that is important after that. The night before Jesus was crucified, Peter said, “I will not deny you, even though everybody else will. No, not me, I won’t deny you.” This was not a display of boldness; it was a display of brashness on his part. He may have said it with his lips, but what did he mean? When it came to the time of testing he did not stand. No, that is not what is meant by boldness. Remember Simon the sorcerer in Acts chapter 8? Simon was a bold man in some ways, but is that the sort of boldness the Word is talking about? Philip went to Samaria to help the people receive the power of God, and he performed many miracles. Verse 9 informs us that “there was a certain man called Simon, which beforetime in the same city used sorcery, and bewitched the people of Samaria, giving out that himself was some great one.” Is that what we mean by boldness? A certain boxer once boldly proclaimed, “I’m the greatest” — but in the end someone beat him. Is that boldness? “I’m a child of God; I’ve got all the manifestations of the spirit.” Simon had that sort of audacity, but without a knowledge of that truth. Simon had a certain belief in his own devilish power, but was that boldness? Obviously, a lot depends on what your boldness is based. Is it on your own strength, or your desperation in a certain tight spot? Suddenly there is a sickness in your family or a great financial need. Your boldness cannot be based upon desperation. You need this boldness all the time. “The righteous are bold as a lion.” Is your boldness based on a firm foundation? “But even after that we had suffered before, and were shamefully entreated, as ye know, at Philippi, we were bold in our God to speak unto you the gospel of God with much contention” (I Thessalonians 2:2). Where was Paul’s boldness? “We were bold in our God.” That is where our boldness must be. We must be bold to the end of speaking about the good news. This particular word for “boldness” is used 39 times, and 28 times it has reference to boldness in speech. Paul was not bold because he was a brilliant man, educated in the top university of his day under the best teachers, nor because he had a tremendous command of oratory. But he was bold in one thing: “…in our God.” You cannot find a better basis than that. Do you want to be a bold Christian or a cold Christian? Most people know that there is more than one kind of Christian. They think that what they see is the normal type of Christianity, but it is not. It may be the common type but in reality it is abnormal. Bold Christianity is that described in Ephesians 3:12, “In whom we have boldness.” In Christ we have boldness. Well then, have you got it or haven’t you? We have boldness. It is part of God’s spiritual gift package that we received when we accepted Christ as our personal Saviour. “In whom we have boldness” — that settles the matter. I do not have to pray for it, work for it, or hope for it. I already have it. Only one question remains: What am I doing with it? “Wherefore, though I might be much bold in Christ to enjoin thee that which is convenient” (Philemon 8). Paul indicates here that he could be much bold in Christ. Not once does he say he was bold because of anything he was or had done. He was bold because of what Christ had done for him. Christ made it available for him, he accepted it, and he put it into action in his life. “I might be much bold in Christ to enjoin you.” This is boldness in speaking to them about certain matters. “For they that have used the office of a deacon well purchase to themselves a good degree, and great boldness in the faith which is in Christ Jesus” (I Timothy 3:13). They had great boldness in the faith which is in Christ Jesus. The basis for our boldness is in Christ, not in ourselves. It has been made available to us; it is part of God’s spiritual gift package. “Let us therefore come boldly unto the throne of grace, that we may obtain mercy, and find grace to help in time of need” (Hebrews 4:16). “Having therefore, brethren, boldness to enter into the holiest by the blood of Jesus, By a new and living way…” (Hebrews 10:19, 20). “Having therefore… boldness.” You already have it. But you must manifest it in your fellowship with God. The words “let us” indicate that we must make the effort to come boldly before our Father. Since God has made boldness available to us, should we not want to use it fully and enjoy the benefit it brings? “Beloved, if our heart condemn us not, then have we confidence [boldness] toward God” (I John 3:21). “And this is the confidence [boldness] that we have in him, that if we ask anything according to his will, he hears us” (I John 5:14). Do we have confidence or boldness towards Him? Yes, the Word says so. And the particular area of boldness towards Him stated here is that if we ask anything of Him according to His will, He hears us. Then we know that we have the petition that we desired of Him. Yes, the righteous are bold as a lion. The boldness of the believer is also manifested in our walk. We need boldness as we live, doing the things the Father expects us to do. In Acts chapters 3 and 4 we have a wonderful record about Peter and John. They ministered healing to the man at the Beautiful gate of the temple. A tremendous miracle took place. When you meet the needs of humanity sometimes there are people who do not like it. In this case, they were religious people. They brought Peter and John before the court and asked, “By what power, or by what name, have ye done this?” (Acts 4: 7). Peter demonstrated his boldness by the note of authority in his reply. “Now when they saw the boldness of Peter and John, and perceived that they were unlearned and ignorant men, they marvelled; and they took knowledge of them, that they had been with Jesus” (Acts 4:13). Peter and John belonged to the family of God. They were righteous, and could be bold as lions. After they were let go, they went back to the local fellowship. They had been told “not to speak at all nor teach in the name of Jesus” (verse 18). Notice what they prayed (Acts 4:29): “And now, Lord, behold their threatenings: and grant unto your servants, that with all boldness they may speak thy word.” The Word also records that they put into action what they were praying about: “…they spake the word of God with boldness” (verse 31). “But Barnabas took him [Paul], and brought him to the apostles, and declared unto them how he had seen the Lord in the way, and that he had spoken to him, and how he had preached boldly at Damascus in the name of Jesus” (Acts 9:27). Paul went to Damascus following his dramatic conversion. There were some Jews who wanted to kill him, and in the end he had to get out of town in a hurry. But while he was there he spoke boldly in the name of Jesus. He knew the authority and the power of the name of Jesus. He knew that these belonged to him, and he was not ashamed to manifest that power boldly. His boldness did not diminish with time, for we read that later “he was with them coming in and going out at Jerusalem. And he spake boldly in the name of the Lord Jesus, and disputed against the Grecians: but they went about to slay him” (Acts 9:28, 29). “Then Paul and Barnabas waxed bold, and said, It was necessary that the word of God should first have been spoken to you: but seeing you put it from you, and judge yourselves unworthy of everlasting life, lo, we turn to the Gentiles” (Acts 13:46). Paul and Barnabas were on their first journey, ministering the greatness of the Word wherever they went. In Antioch in Pisidia they first taught in the synagogue on the Sabbath. While their message was apparently accepted, opposition from the Jews developed, yet “the next sabbath day came almost the whole city together to hear the word of God”. (Acts 13:44). The Jews started contradicting and blaspheming, so Paul and Barnabas turned away from a Jewish setting to spend a profitable period of time with the Gentiles. They continued to manifest their boldness, but in a different direction. It is necessary to manifest our boldness when taking a stand for the integrity of God’s Word. Community pressure is at times great, and we as believers need to boldly stand for the Word of God, even at the expense of losing some friends, neighbours, or relatives. “Long time therefore abode they speaking boldly in the Lord, which gave testimony unto the word of his grace, and granted signs and wonders to be done by their hands” (Acts 14:3). Paul and Barnabas moved on to the next city to continue sharing the Word. Even though opposition quickly developed (verse 2), the apostles did not hesitate to speak “boldly in the Lord.” This phrase again reminds us our boldness is not something we work up ourselves, but it is ours “in the Lord”; a part of God’s spiritual gift at the new birth. In Acts 18:24-28 we find a young man named Apollos in Ephesus. He was an eloquent man with a tremendous grasp of the Old Testament scriptures. This man was instructed to some degree in the way of the Lord, and was fervent in the spirit, on fire, as he spoke and taught diligently the things of the Lord, knowing only the baptism of John (verses 24 and 25). “And he began to speak boldly in the synagogue…” (verse 26), speaking boldly that part of the Word which he knew. He was not only bold, but teachable also: “…whom when Aquila and Priscilla had heard, they took him unto them, and expounded unto him the way of God more perfectly” (verse 26b). Later, we read of Paul in the same town of Ephesus, who “went into the synagogue, and spake boldly for the space of three months, disputing and persuading the things concerning the kingdom of God” (Acts 19:8). “The righteous are bold as a lion.” Notice some of the words that were used in the passages I quoted: “Much bold, all bold, great boldness, much more boldness.” All these expressions are used concerning believers. So what kind of a believer are you going to be: a bold one or a cold one? Only one kind will have an effect upon this world: the righteous who are bold as a lion. Remember, you have boldness already. Now rise up and manifest it for the glory of God. This entry was posted in Bible Teachings, Inspirational Messages and tagged bold as a lion, boldness, boldness for God, bravery, Christ, christian courage, confidence in the Lord, courageous, fight the good fight, honor, no fear, Proverbs 28:1, righteous, the faith, the righteous are as bold as a lion. Bookmark the permalink. Good words here. Words that touched me and inspired me. May the Lord keep opening up the doors of utterance that we may continue to speak boldly.